Legend has it that it all began in a small part of Honan province in China at a temple known as Shaolin Ssu, the Young Forest Temple. Nestled here at the foot of Sung Shan (Sung Mountain), monks, plagued by bandits, hired instructors to teach them self defence. 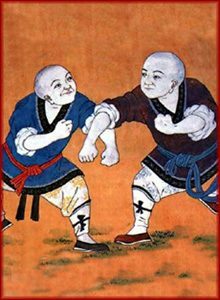 Finding a focus in their martial training, these monks learned and grew, collecting and developing different forms and styles of fighting arts and, thus was born the legend of the Shao-Lin Fighting Monks. It was in the sixth century that Ta Mo, known as Bodhidharma in India, crossed the Himalayas and taught the Shaolin monks the 49 postures of the I Chin Ching, the Muscle Change Classic. Throughout the next centuries the Shaolin monks added to and perfected their art, and spread to other temples. The monks of the Fukien, Shantung, Omei, Kwangtung, Wutang, and Hua Mountain Temples focused their attentions on various aspects of the art, among them Northern and Southern Fist, Shantung Black Tiger, Fist of Hua Mountain, Iron Bone Training, T’ai Chi Ch’uan, and many and varied weapons. Shaolin Kung Fu exists to this day, over fifteen hundred years after Ta Mo’s arrival at the Shao-Lin Ssu. His 49 postures of the I Chin Ching and much of the subsequent material has survived. The Shaolin Art has prevailed despite various attempts to erradicate it. The Shaolin Ssu exists to this day and can be visited, as does the cave where Ta Mo is said to have meditated for nine years. The Chinese Shao-Lin Centres continue to teach this art to students today in the United States and in Ireland.